Duval Paving, LLC has been pouring concrete for 8 years. Our professional paving crew can install a functional or decorative concrete surface for all of your Earleton hardscape needs. For Earleton driveways, pool areas, walkways, sidewalks, patios, and more, call Duval Paving, LLC for professional concrete installation. We serve residential and commercial clients in Earleton, Florida. No need to sacrifice style. Just because you have a small budget, doesn't mean you have to sacrifice style. With a custom concrete installation, Duval Paving, LLC can make your Earleton hardscape as decorative as it is functional. Concrete can be colorized, texturized, or stamped or imprinted to customize your surface with the look of more expensive building materials like cobblestone, pavers, or brick. Duval Paving, LLC has been in the paving business for 8 years, making concrete surfaces in Earleton, FL look great. All of our customized concrete is sealed to protect and enhance your hardscape surface. We use polymerized sealers and non-slip finishes for maximum durability. Once your decorative concrete hardscape is installed, it only requires a sealer coat every couple of years. 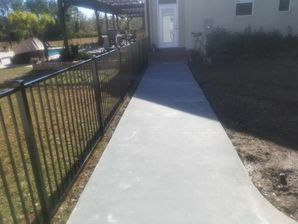 Duval Paving, LLC also provides non-decorative concrete installations for Earleton driveways, Earleton sidewalks, Earleton walkways, and Earleton patios. Call (904) 201-2161 to discuss your concrete surfacing needs. We'll help you choose the right concrete installation for your job. Call Duval Paving, LLC for professional concrete surfacing. Consider the many advantages of concrete when you are ready to add a driveway, patio, walkway, or pool deck to your property. It's inexpensive yet is strong enough to accommodate heavy loads. Whether you're looking to pave an Earleton residential or Earleton commercial hardscape, the concrete experts at Duval Paving, LLC will make sure that your project is handled professionally from start to finish. Call (904) 201-2161 to get started. 5★★★★★ - "They are very professional and so much experienced. Duval Paving made my driveway with a unique design. I am so happy. Thank you so much Duval Paving." 5★★★★★ - "These guys know what they're doing, I’d recommend them anytime." 5★★★★★ - "Duval was the best!" 5★★★★★ - "Very professional and high-quality company from start to finish"
Was done to our satisfaction and at a great price the crew was neat and professional. The only sign that they were here is the new driveway. Our neighbor also used them for there asphalt millings driveway We are both happy customers"
5★★★★★ - "When I select another place for a driveway, I really want to get back Duval Paving. Because they are doing work amazing at a very cheap rate." 5★★★★★ - "Wow, extraordinary mind-blowing work. I am really happy with their work. They are really professional and experienced. Duval Paving made my driveway at my house look awesome. Thanks a lot, Duval paving." 5★★★★★ - "Great job. Fast communication with their customer. They are really good to work with. Thank you Duval Paving." 5★★★★★ - "Duval Paving Company prepared my driveway 5 years ago. It still looks like new. Thank you for your great job." 5★★★★★ - "Beautiful work. Everybody was so helpful. They prepared my driveway 10 days ago and are perfect for paving driveways. Highly recommend!" 5★★★★★ - "I thought Duval Paving did an excellent job on our millings for our road. I highly recommend them. Thank you, John, for being so helpful and prompt." 5★★★★★ - "These guys are fantastic. Highly recommend them!!!" 5★★★★★ - "I had John asphalt my carport and driveway and he did a very good job. In fact he made it a little better than the agreed on option." 5★★★★★ - "Duval Paving did a commercial paving job for us in Jacksonville. The asphalt paving job went good, it looks nice, and we are happy. Good job, John, and thank you for your service." 5★★★★★ - "After checking several other paving companies, we finally decided on The Paving Company. John was conscientious and clearly takes pride in his work . He did everything possible to make us happy. The crew also did a great job and had everything cleaned-up before leaving." 5★★★★★ - "Thanks for going the extra mile to get my millings driveway completed on time. Everything done as promised." 5★★★★★ - "Thanks for the great job and great price, we were very impressed from start to finish and the driveway is amazing"
5★★★★★ - "Thank you for the hard work the Asphalt milling's; looks great, God bless"
5★★★★★ - "Over all a good job, we got exactly what we wanted at a good price. We decided to use asphalt millings for our new driveway"
5★★★★★ - "These guys did a very good job paving our driveway. We are very happy and will recommend you any time. And if someone wants a recommendation, give out our number." 5★★★★★ - "Very good job"